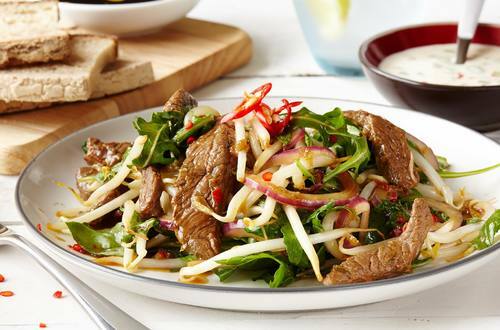 Simple Thai beef salad with creamy Hellmann's® or Best Foods® Real Mayonnaise. Enjoy as lunch or a light dinner. 1 From the lime, grate enough peel to measure 1/2 tsp. and squeeze juice; set aside. 2 Combine soy sauce, 1/2 Tbsp. fish sauce, garlic, 2 chopped chili peppers, lime juice and lime peel in large bowl. Stir in beef. Cover and marinate 20 minutes. 3 Remove beef from marinade; pat dry. Reserve marinade. Heat large nonstick skillet over medium-high heat and brown beef, stirring occasionally. Remove beef from skillet and set aside. 4 Add reserved marinade, water and Knorr® Beef flavor Bouillon Cube(s) in same skillet and cook over medium heat, stirring frequently, until slightly thickened, about 5 minutes. Stir in arugula, bean sprouts, cilantro, basil and mint and cook, stirring occasionally, 3 minutes. Stir in beef and any juices. Spoon into 4 bowls. 5 Combine Hellmann's® or Best Foods® Real Mayonnaise, sugar, remaining 1/2 Tbsp. fish sauce, and remaining chili pepper. Stir in green onions and drizzle over salad. Garnish, if desired, with sliced red onion.